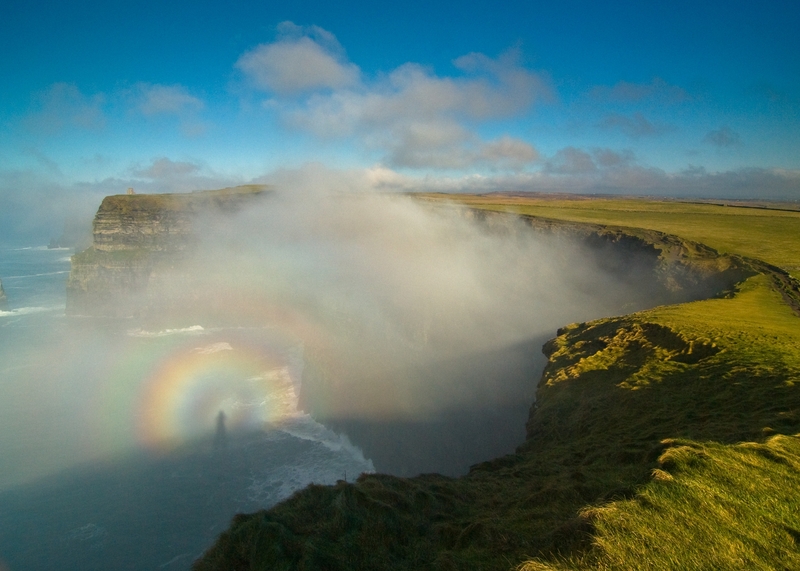 The iconic Cliffs of Moher in County Clare has often been a lasting image for many visitors during a vacation in Ireland and the one millionth visitor to the Cliffs of Moher Visitor Experience in 2014 has been recently recorded. This marks the first time that the milestone figure has been reached at the ever popular visitor attraction. The world renowned attraction was acknowledged when the one millionth visitor, Rita Shaw, and her husband Stephen were greeted on-site with music and a champagne reception before being presented with a certificate marking the occasion as well as a €5,000 prize return vacation package to Ireland. This reflected the continued growth of the Cliffs’ popularity as it marked the fourth successive year that increased visitor numbers to the Cliffs of Moher Visitor Experience were recorded with figures for the year so far up 12p% on 2013. The visitors centre which is owned and managed by Clare County Council has been the recipient of substantial investment in both product and facilities throughout 2014. As much as €600,000 has been invested in additional coach parking facilities, new exhibition content, restoration works in O’Brien’s Tower and a redesign of the foyer at the visitor centre. Director of the Cliffs of Moher Visitor Experience Katherine Webster said the visitor growth is the result of “a perfect storm of positive factors combining to drive visitor numbers over the one million mark”. “New routes and increased access into Shannon Airport, the launch by Fáilte Ireland of the Wild Atlantic Way on which the Cliffs of Moher are a Signature Discovery point, the popularity of the 12-kilometre Cliffs of Moher Coastal Walk and the Cliffs of Moher’s close links with Brian Ború during the millennial anniversary of his death have all contributed to the visitor number increase during 2014,” she added. This entry was posted in Best Attractions in Ireland, Best Places to visit in Ireland, Clare, Ireland, Ireland Vacations 2014, Self Drive Vacation Ireland, Visitor Attractions, Wild Atlantic Way and tagged Best Attractions in Ireland, best attractions in Ireland for 2014, Cliffs of Moher, Cliffs of Moher Visitor Experience, County Clare attractions, Ireland visitor attracttions, The Cliff. Bookmark the permalink.